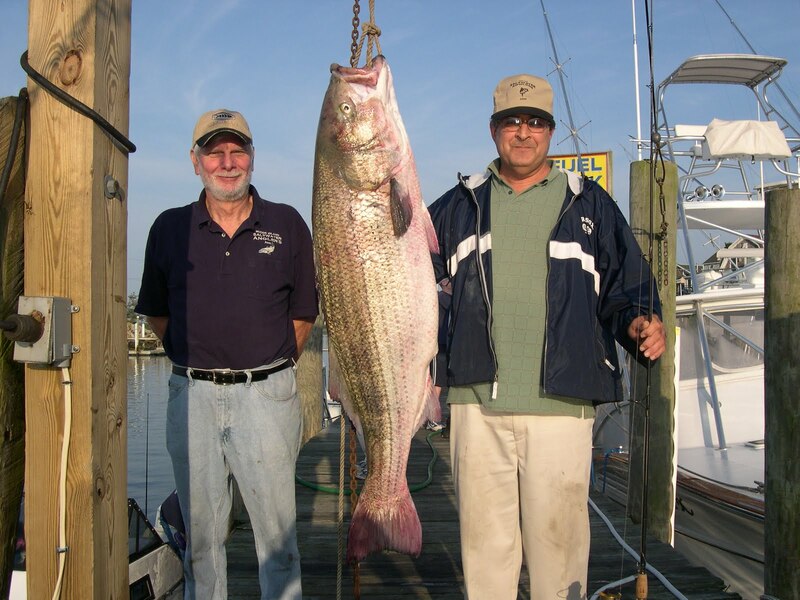 Peter Vican (right) of East Greenwich with his record 77.4 pound striped bass. Peter caught the bass Sunday using eels as bait while fishing with Don Smith (left) on the Southwest side of Block Island. 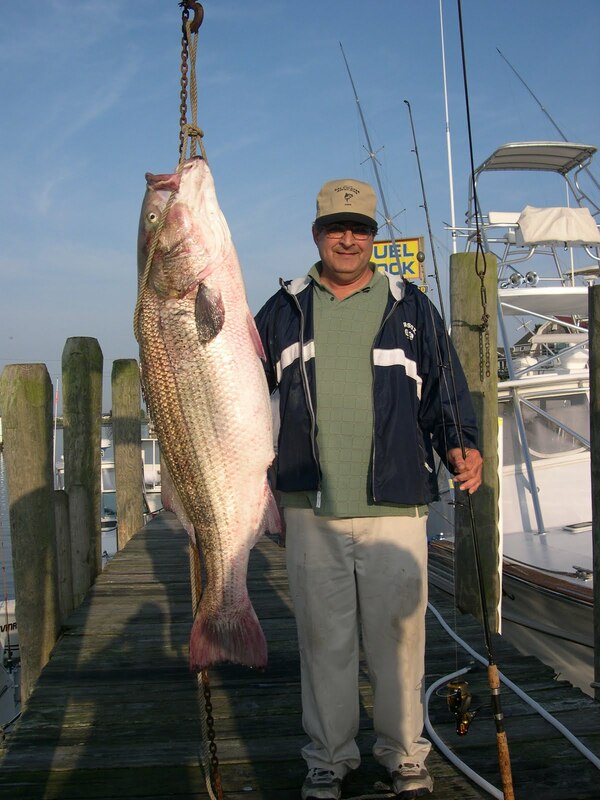 Peter Vican of East Greenwich, RI caught a record 77.40 lbs. 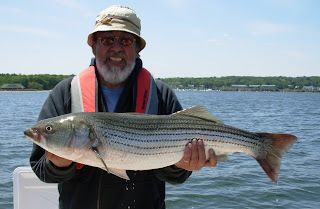 striped bass on Sunday, June 19. It is the largest fish ever caught in RI. 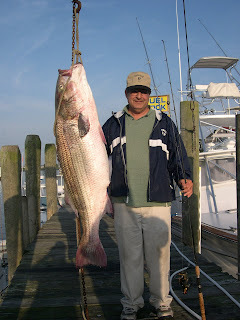 Peter held the old record too… a 76 lbs 14 oz bass he caught off Block Island in 2008. The record fish was caught Sunday night using eels as bait on the Southwest side of the Block Island. It was just one pound shy of the world record. Peter and his fishing friend Don Smith are arguably the best recreation striped bass fisherman on the east coast. They catch fish in the 40 and 50 pound range often, as a matter of course, where most anglers would dream of catching one in this size range. Peter was fishing with his friend Don this Sunday when he hooked up with the record breaking fish. Here is Don’s account of their fishing outing. “We fished an area on the Southwest side of the Island from 9:30 p.m. until after 1:00 a.m. Sunday morning. We landed more than a dozen fish apiece over 25 lbs. often doubling up on each drift. Right around midnight we doubled up on several large fish. I landed a 48 lbs. fish and Peter's was just slightly smaller. On the very next drift we duplicated the catch with both of landing fish around 45 lbs. Since I had kept the 48 lbs. bass all the others were released unharmed. We were fishing our usual method of using light tackle, 6/0 octopus circle hooks and drifting live eels. The current was pretty strong and we used 3 oz. egg sinkers to keep the eels in the zone near the bottom. Shortly after 1:00 a.m. the drift died and dogfish moved into the area and starting chopping up our eels… Once the tide started running again we worked our way back to the spot that had been producing large fish earlier in the night. I got the net ready and moved over to his side of the boat just as he got the fish to the back corner of the hull. When the fish saw the boat it rolled on its side and swam directly out to the side away from the boat. That was when I got a good look at the fish and yelled to Peter it was a monster… I don't think the fish got more than 25 or 30 feet from the boat before Peter had it turned and it swam right back at us. By then I was really excited and had the net in the water and the fish headed right into it…I was so hyped up after seeing it that I just bent over and grabbed the circular frame of the net and lifted it right out of the water and flipped it onto the deck of the boat. The fish was next to my 48 lb. bass and looked like it could have swallowed it. The fight only lasted about 10 minutes. Paul Harrison of Fall River, MA with the 8.5 fluke he caught off Point Judith while charter fishing with Captain John Sheriff last week. 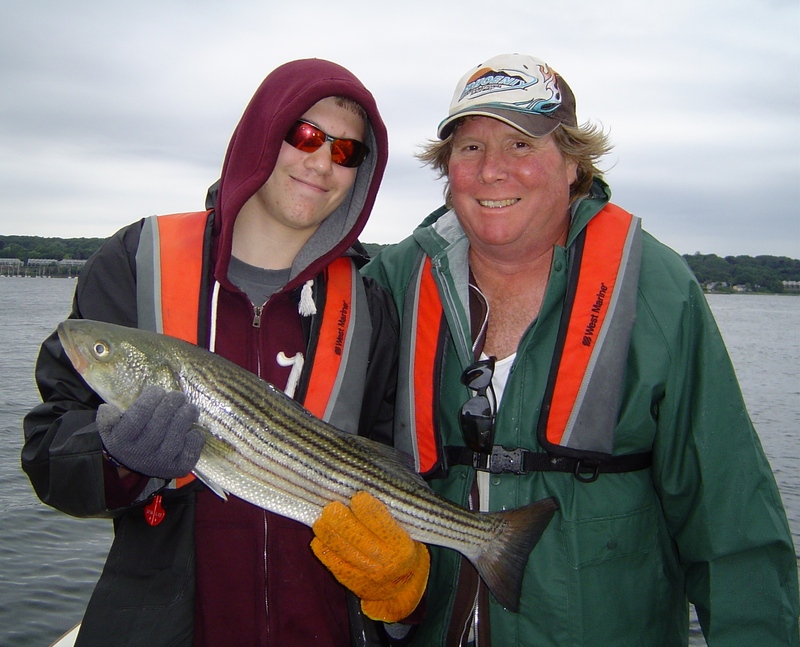 Jeff Briggs (left) of Bristol and his father Gary (right) with the first striped bass keeper Jeff has ever caught. The fish was taken in the East Passage. 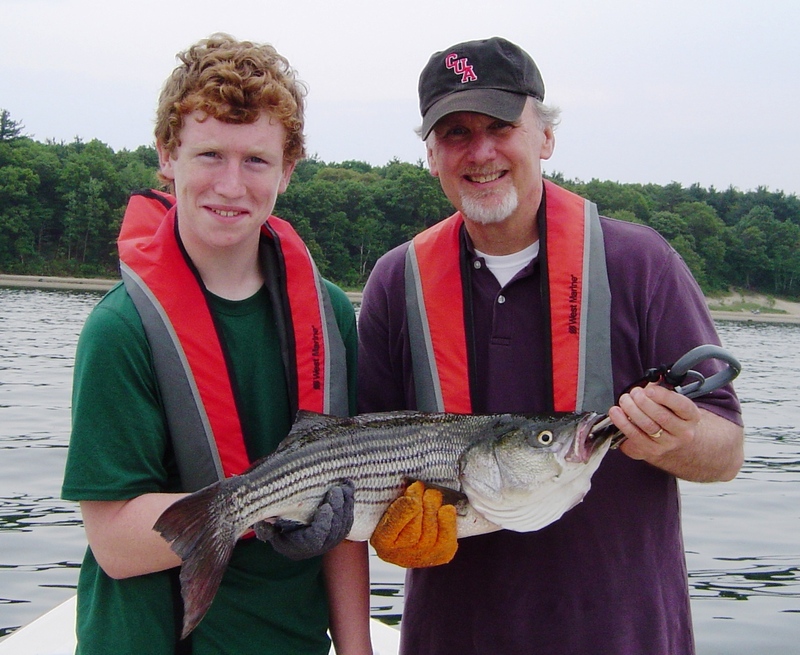 Peter Vican of East Greenwich, RI caught a record 77.40 lb striped bass this Sunday, June 19. Peter’s fish set a new Rhode Island state record. The fish was caught at night using eels as bait outside New Harbor, Block Island. The fish was just one pound shy of the world record. Congratulations Peter. With the Fourth of July fast approaching and the 2011 saltwater fishing season underway, the Department of Environmental Management reminds anglers and spear fishers that a 2011 saltwater fishing license is needed to fish recreationally in all marine waters. You can get a license online or at participating bait and tackle shops or sporting good stores. Obtaining a license online is easy. Just go to www.saltwater.ri.gov. Have a driver's license or state identification card handy, as well as your date of birth, address, and phone number. For Rhode Island residents over 65 and for active military personnel stationed in the state, licenses are free, but still required. For all others, the $7 fee ($10 for non-residents) is payable using a VISA, MasterCard or Discover card. Once the information is entered, you can immediately print your license and go fishing. No license is needed for children under 16; anglers fishing on a licensed party or charter boat; anglers who hold a Highly Migratory Species Angling permit; anglers or spear fishers who are on leave from active military duty; or anglers or spear fishers who are blind or permanently disabled. Safe boating patrols will be stepped up on June 24 to June 26 in a joint operation conducted by the Department of Environmental Management’s Division of Law Enforcement and US Coast Guard Units from Castle Hill and Point Judith. The effort is part of Operation Dry Water, a coordinated national weekend of Boating under the Influence (BUI) detection and enforcement. It is aimed at reducing the number of alcohol-related accidents and fatalities, and fostering a stronger and more visible deterrent to alcohol use on the water. Marine law enforcement officers will be out in full force on Rhode Island waterways throughout the long weekend, searching for boat operators whose blood alcohol content exceeds the limit of .08 percent. Rhode Island law sets limits and penalties for boating while intoxicated that are similar to the driving while intoxicated standards, and requires the same levels of testing. The Special Senate Taskforce on Fisheries, chaired by Sen. V. Susan Sosnowski (D-Dist. 37, South Kingstown, New Shoreham), has released its final report detailing the challenges facing the fisheries industry in Rhode Island. The taskforce was developed on November 18, 2010 to track the status and trends of the fishing industries of Rhode Island. It was charged with working cooperatively with management agencies, educational institutions, environmental organizations, businesses and fishermen to meet the challenges ahead and recommend viable ideas and solutions for protecting the fishing way of life. Here are highlights of findings and actions taken by the task forces to address key issues. Finding: Rhode Island’s lack of representation on the Mid-Atlantic Fisheries Council. Action: Introduction/passage of a bill urging our state Congressional Delegation to pass representation legislation. Finding: RI’s current regulations do not facilitate the sale of local fresh fish at farmers’ markets and other mobile market venues. Action: Passage of a bill by the Senate to establish a Rhode Island Seafood Marketing Collaborative that will address regulatory and marketing issues pertaining to local seafood. Finding: RI aquaculture farms are not inspected twice annually by the RI Department of Health and DEM which is a violation of the federal Food and Drug Administration requirements. Action: At the Fisheries Taskforce meeting, DEM addressed these concerns and discussed potential solutions through agency regulations and policies implemented at a future date. Finding: RI seafood products face domestic competition from imported seafood products, with more than eighty percent of the total seafood consumed in the US originating in foreign countries. Action: Introduction and passage of a Senate bill urging Congress to pass legislation that support adequate funding for effective and sustained domestic marketing of US seafood. Finding: RI law requires that shellfish harvested from polluted waters be transferred to clean water for one year before selling, other New England states require as little as three weeks. Action: At a Taskforce meeting, DEM addressed concerns and discussed solutions through future regulations and policies. Finding: Rhode Island commercial and recreational fishermen face minimal state penalties and fines for illegally possessing striped bass and for repeat offenses of such violations. Action: Passage of bill by Senate Judiciary to increase the fines and penalties for illegally possessing striped bass. Finding: There is not a federally-funded national seafood marketing fund available for the domestic marketing of American seafood. Action: Senate resolution 2011-S 0850 also addresses this concern. Finding: The lack of resources and materials to support consumer seafood education programs results in consumers being unaware of the availability of locally caught fresh seafood products. Action: Senate bill 2011-S 0997 also addresses this concern. Striped bass fishing has been improving. Matt Conti of Snug Harbor Marina said, “The bass are getting larger. We had fish in the 40 lbs and 50 lbs range this week and then Peter Vican’s record fish”. Still a log of dog fish when the water is not moving. Fishing in the East Passage is still very good. Anglers reporting pods of menhaden from Popasquash Point, Bristol all the way up the Providence River. Fish being caught on live and chuck menhaden as well as tube and worm. Don Hampton of Holden, MA caught three nice keepers last week while using light tackle fishing in the East Passage on No Fluke charters. Fluke fishing is improving too. Reports of large fish over 15 lbs being taken off Warwick Neck. 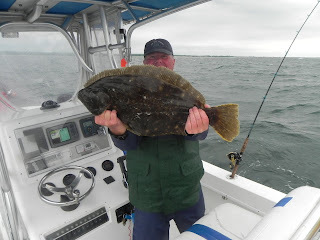 Captain Rich Hittinger said, “The fluke are getting large.” Rich reports a good fluke bite off southern coastal shores with fish in the 8 to 9 lbs range being taken last week. Warwick Firefighters Andy Sisson, Matt Goodreau, Tom Bradley and Mike Bingham with the fluke they caught aboard Priority Too Charters fishing with Capt. Rick Bellavance. Joe Daniels of Warwick caught this 35” striped bass when fishing the channel pad east of Conimicut Light. This was one of ten bass he caught while fishing with Capt. 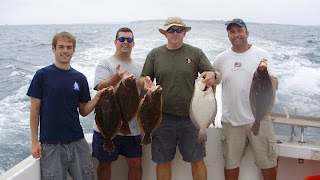 Monti on No Fluke Charters. Ken Landry of Ray’s Bait & Tackle, Warwick with the jumbo fluke he caught off Warwick Neck fishing the edge of the channel. Fluke fishing this week continued to improve and will just get better over the next couple of weeks. Now is the time to give it a try. Here are some helpful fluke facts and tips from the experts. Ken Landry of Ray’s Bait & Tackle of Warwick says big ones are on the edges of channels, drifting from low to high water often yields big fluke. Ken said, “It’s important to drift with current and wind in the same direction. Working the channel edges off Warwick Neck Light yielded close to a 15 pound fluke. If there are fluke under the boat, Ken will find them. Hess LNG withdrew its proposal for a liquefied natural gas terminal on the Taunton River Monday. They cited "unfavorable" economic conditions. There is still time to volunteer for the Rhode Island Saltwater Anglers Association’s Take-a-kid fishing event Saturday morning, June 18. To volunteer, contact Steve Medeiros at 401.826.2121. Earlier this week NOAA announced national sustainable marine aquaculture policies to meet the growing demand for healthy seafood, to create jobs in coastal communities, and restore vital ecosystems. Foreign aquaculture accounts for about half of the 84 percent of seafood imported by the U.S., contributing to the $9 billion trade deficit in seafood. Learn more at http://www.noaa.gov . The Rhode Island Senate Committee on Environment & Agriculture chaired by Senator Susan Sosnowski passed the Seafood Marketing Collaborative bill last week. The bill would establish an effort to facilitate the distribution and marketing of fresh RI fish to Rhode Islanders. At press time the bill was going to be moved to the Senate floor for a vote. Striped bass. Ken Landry of Ray’s Bait & Tackle, Warwick, said he caught a number of bass Saturday at Warwick Neck using chucks of Menhaden. Ken said, “I would spot the on the fish finder, send down a chuck and then bam, we were on.” Ken said he hooked up with several fish using this method. John Littlefield of Archie’s Bait & Tackle, Riverside, said “Customers are catching plenty of small bass in the upper Bay with keepers mixed in. Most are catching them with live menhaden or chucks as well as clam worm.” Anglers at the North Rip, Block Island are catching bass with a lot of dog fish present. 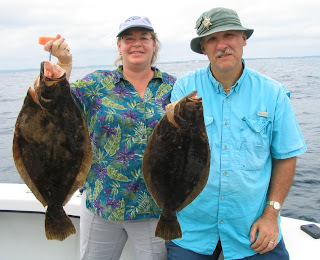 Lynn and Pelky from upset New York with the fluke they caught with Capt. John Rainone of L’il Toot Charters , Narragansett, RI. 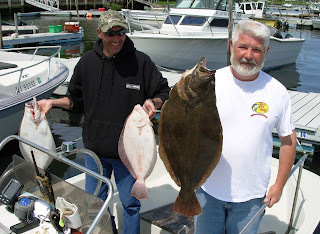 Darrell Hatten (right) of North Kingstown with the 8 pound, 12 once fluke (summer flounder) he caught off Rose Island. He and friend Mike Swain (left) of Coventry took seven keepers Saturday, a total of fourteen fish were caught. Ben Roach of Jamestown with the fluke he caught on his father’s boat, Capt. Rob Roach of Kettlebottom Outfitters. Fluke fishing is great. Fluke (or summer flounder) are biting off southern coastal beaches as well as favorite places at the mouth of the Bay off Newport, Jamestown, South Kingstown and Narragansett. This year with the legal minimum size reduced to 18 ½” the season promises to be a good one. 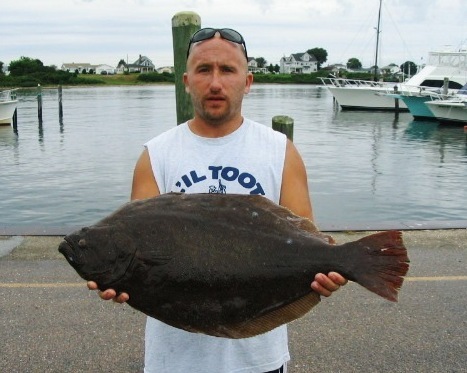 Darrell Hatten of North Kingstown caught an eight pound, twelve once fluke off Rose Island, Newport this Saturday. He and friend Mike Swain of Coventry landed a total of fourteen fish, seven of them were keepers. With the recreational fluke season just starting here are some fluke fishing tips from the pros (more to come next week). Steve Medeiros, president of the Rhode Island Saltwater Anglers Association (RISAA), said last week at a hearing before the Senate Judiciary Committee on RISAA’s bill to increase fines for the illegal possession of striped bass, “Chief Steve Hall (Rhode Island DEM Enforcement), George Allen and I testified in favor of the bill. When done the committee held an immediate vote- unanimous in favor. It now goes to the full Senate for a vote. “The legislation would raise the fines for the illegal possession of striped bass up from the current $50 to:$100 first offense; $200 second offense and can confiscate equipment, boat, etc. ; and $500 third and subsequent offenses and can confiscate equipment. Effective June 3 through August 31, 2011, the National Marine Fisheries Service (NMFS) adjusts the General category Atlantic bluefin tuna (BFT) retention limit to three large medium or giant BFT per vessel per day/trip for commercial boats. The General category daily retention limit applies to vessels permitted in the commercial Atlantic tuna’s General category and the Highly Migratory Species (HMS) Charter/Headboat category while fishing commercially. For further information, visit http://www.nmfs.noaa.gov/sfa/hms/breaking_news.htm. RISAA is looking for volunteer boats and mates as well as volunteers for land based activities during their annual Take-a-kid fishing event Saturday morning, June 18. It is a great cause. Last year over 200 children fished on 85 boats, many of them on the Bay for the first time. To volunteer, contact Steve Medeiros at 401.826.2121 or register online at http://www.surveymonkey.com/s/TAK2011 . Striped bass fishing remains good in the Bay with action around Block Island starting to pick up. Captain John Sheriff reports an outstanding bass bite with fish to 36” at the North Rip, Block Island on Monday. Captain Rick Bellavance of Priority Too Charters said, “Fishing the North End of Block Island we easily limited out on striped bass (this past weekend and Monday).” This weekend Joe Daniels of Warwick caught ten bass and three keepers with the largest fish 35” when fishing in the upper East Passage on No Fluke Charters. Fluke (summer flounder) fishing is heating up nicely. Alan Stewart of Westport, MA reports a good fluke bite off Bailey’s Beach and Elbow Ledge near the mouth of the Sakonnet River. Stewart said, “We were surprised at how good the fishing was. We ended up with 8 keepers up to 26" and a few shorts… all on squid strips.” Darrell Hatten of North Kingstown caught an 8 pound, 12 once fluke off Rose Island, Newport while fishing with skipper Mike Swain of Coventry. They took seven keepers Saturday, a total of about fourteen fish were caught. Fancies Fleet party boat vessels our of Pt. Judith report a good fluke bite that is improving weekly. Tuna fishing reports are good. Robb Roach of Kettlebottom Outfitters said, “Just talked to a offshore lobster friend who reports yellowfin (lots of them!) in the tails and dip. SST's support this and the heaviest break is actually northeast of the tails- 52 to 72.” Kettlebottom Outfitters is booking tuna charters on their new 35 foot Aerocat. You can get out to the tuna in two and a half hours. Contact Capt. Robb Roach at http://www.kettlebottom-outfitters.com/ . Michael Weaver of Plymouth, New Hampshire caught this keeper bass aboard No Fluke Charters of East Greenwich using a weighted T-Man bubble gum tube & worm while fishing in 13 feet of water north of Conimicut Light. Alan Stewart of Westport, Massachusetts with bass he caught off Prudence Island in 80 feet of water using a whole native squid. 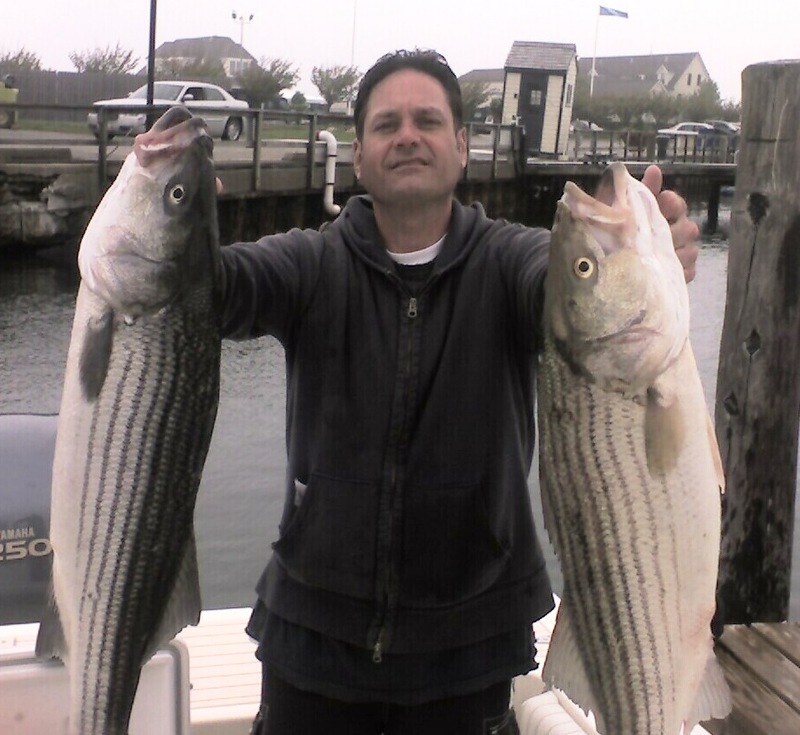 Craig (left) and Jay Conway (right) of North Kingstown, Rhode Island fished No Fluke Charters on Memorial Day and caught six striped bass, the largest was 32”. Monday the bass bite was on in the East Passage. Jay and Craig Conway caught six bass, the largest 17 pounds, 32”. Sunday morning I caught two keepers at 29” and 30” in Greenwich Bay between Sally Rock and Sandy Point. Saturday Michael Weaver of Plymouth, New Hampshire fishing on No Fluke Charters caught nine bass and two keepers north of Conimicut Light. The restricting of menhaden boats north of Conimicut Light and in Greenwich Bay has improved fishing. 2. Surface plugs or poppers. Great way to catch school bass in the spring. 3. Swimming lures. My favorite is a grey Yozuri Crystal Minnow. 4. Parachute squid jigs. Often used in ocean water (or where there are squid). Anglers successfully use this method off Newport, Narragansett and Block Island. 5. Trolling with tube and worm. The idea is to get the bait down to where the fish are. Big fish often at bottom waiting for prey. I have found less line beneficial in tight quarters where maneuvering is tough. Use lead line in Bay and wire offshore in deeper water. Use different colored tubes until you find one that works. NOAA is formally designating both the western Atlantic and eastern Atlantic and Mediterranean stocks of bluefin tuna as “species of concern” under the Endangered Species Act. This places the species on a watch list for concerns about its status and threats to the species. The Department of Environmental Management announces that its seasonal 24-hour Bay Line telephone information line is now open. The Bay Line number, 222-8888, is toll-free within the state. Bay Line provides Rhode Islanders with a central telephone number to leave a recorded message about any sign of Bay-related environmental problems throughout the summer season for appropriate follow-up. It also offers updates on water quality in Narragansett Bay, and referral numbers for information about any current restrictions on beaches or fishing. Callers may also pose questions about the Bay. Reports of Bay water quality conditions, updated weekly on Bay Line, are compiled from data provided by a network of monitoring stations in the Bay that monitor oxygen, temperature, salinity, pH levels, and, in some cases, water clarity and the presence of algae blooms. The Department, in cooperation with the University of Rhode Island, has begun the seasonal deployment of additional monitoring instruments. Striped bass fishing is outstanding. 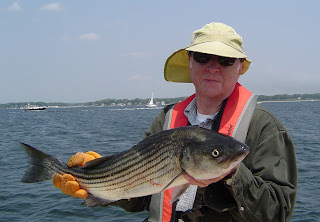 Fished the upper Bay last week and the striped bass were pushing the bait to the surface, you might have thought they were bluefish. Took two fish, one 30" and one 33" fish using T-Man weighted bubble gum tubes in 13 feet of water as close to the bottom as we could get them. Blue fish bite is good. I caught ten small blue fish off Buttonwoods in Warwick using a large surface popper this past Sunday. Lenny Lake of Warwick a fly fisherman said he has been catching 8 to 10 bass per outing in Greenwich Bay and Cove. Last Thursday he was landing a 20” striper, just ready to pull the fish into the boat, when a twelve pound blue fish came up out of the water and bit the striper in half. Fluke fishing is good with fish just starting to get big. Francis Fleet reports fish to eleven pounds taken this past weekend with most customers taking home two to three nice fish. This fishery is expected to do nothing but accelerate over the next three to four weeks as the bio-mass has been enhanced and the legal size has been reduced to 18 ½ “ by DEM this year. Squid fishing remains good this week. They are still here.